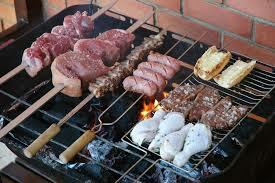 A parrilla is a simple grill in Argentina, but the wonders it can create! As barbecue expert Steven Raichlen noted, “Argentina can be a forbidding place for a vegetarian.” Chimichurri is the sauce most commonly served with beef straight from the parrilla, and there are dozens—if not hundreds—of variations of it, and a debate about whether it should contain chiles. You know which side we favor, and our version of chimichurri contains green ají chiles. Since cattle are so large in Argentina, why not use a huge steak? Serve with grilled sweet potato and poblano chile kabobs, and black beans and rice. Combine all the ingredients for the steak rub. Rub well into the steak, place in a large plastic zip bag and marinate in the refrigerator for a couple of hours or preferably overnight. To make the sauce, combine the vinegar, garlic, jalapeños, and bay leaf in a food processor or blender and process until smooth. Add the onion, parsley, oregano, salt and pepper and pulse until blended but not pureed. Whisk in the oil and allow to sit for a couple hours to blend the flavors. 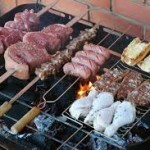 Before grilling, remove the meat from the refrigerator and bring to room temperature. Grill the steak over a medium hot fire for about 20 minutes, turning often for medium-rare (150 degrees F. internal temperature). Remove the steak from the grill, allow to sit for 5 minutes, then slice the meat against the grain and arrange on a serving platter. Ladle some of the chimichurri sauce over the meat and serve the remainder on the side.